I don't mean to ask if your city has a literal copy of the concept that just transposes one place for another - those are fairly commonplace. I mean does your city have a special image or poster all its own that sums it up well, but that we haven't heard of because the scope of its popularity is too local? Here's an example from my hometown: In 1978 The Mad Peck used street names to take a look at Providence. Does your city have a distinctive image, popular with the locals, that has stood the test of time? I'm not sure how iconic/well known it is, but this postcard captures the spirit of (my old hometown) Boulder, CO: Boulder, California. Back in 1997, we apparently had a sign. It's gone now, but the sentiment (and the reputation) lives on. I've seen lots more, but there are a bunch on this page, including Amsterdam, Atlanta, Tel Aviv and China. 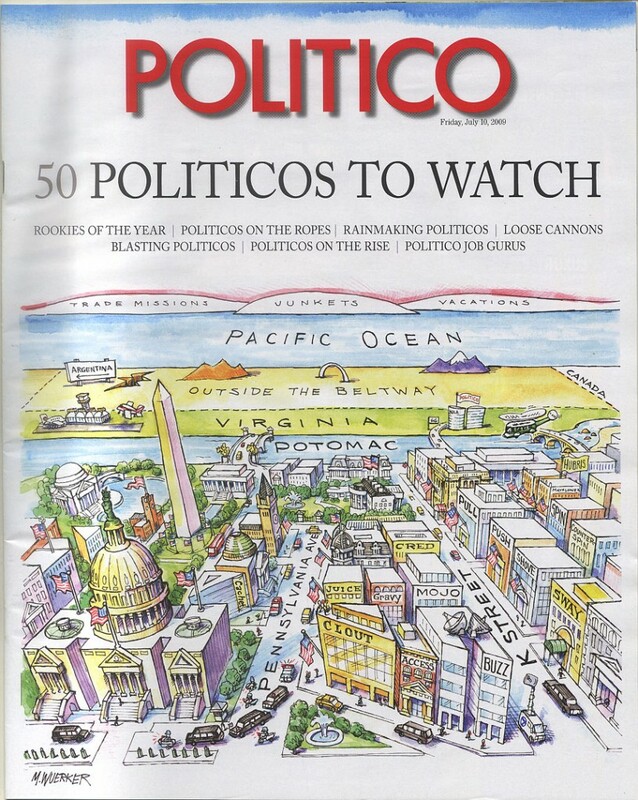 Politico did one recently, too. Yow, sorry, it's the wine. I misunderstood the question. Good night. My city is New York, but I think the Newyorkistan cover from the Dec 10, 2001 issue of the New Yorker has replaced the old Saul Steinberg drawing in the minds of many NYers. It came out just a couple months after 9/11 and reflects a turning inward to examine the city's diversity and self-sufficiency rather than our view of the rest of the country. - and the New Yorker one is very funny. It rewards scrutiny. I think every city with a souvenir shop has these. I've seen them for at least a dozen cities. The real question is whether any are licensed or they're all ripoffs. Jim Borgman, the former Cincinnati Enquirer editorial cartoonist did a 4 part "East Side vs. West Side" that is probably what you're looking for. http://borgman.cincinnati.com/Search.aspx - then click on "East vs. West"
He also did a direct parody with that illustration about how east siders view the west side, but I can't seem to find it online. I don't know if it's completely analogous... but Providence has this. People from my hemisphere like to turn maps upside down. Yes, that's what I was hoping to see. Things more in the vein of the Providence poster, not just rejiggered versions of the Steinberg map.